David Cameron insisted human rights issues were not "off limits" with China today after holding talks with Premier Wen Jiabao. As the two leaders announced a package of trade deals worth £1.4 billion, the Prime Minister said he would always raise difficult questions about political freedom and the justice system alongside seeking closer economic ties. Meanwhile, Mr Wen said Britain and Beijing had to treat each other as "equals" on human rights. He stressed that China was pursuing "political structural reform and improvement of democracy and the rule of law" as well as economic growth. The comments came at a press conference in central London during Mr Wen's three-day visit to the UK. Asked whether he had raised human rights during the talks, Mr Cameron said: "There is no trade-off in our relationship. It is not about either discussing trade or human rights. "Britain and China have such a strong and developed relationship. We have a dialogue that covers all these issues, and nothing is off limits in the discussions that we have." He added: "We are different countries, we have different histories, different stages of development. "We should show each other respect. But we're very clear that political and economic development should go hand in hand, that one supports the other." Mr Wen said: "On human rights, China and the UK should respect each other, respect the facts, treat each other as equals, engage in more co-operation than finger-pointing and resolve our differences through dialogue." He went on: "China is not only pursuing economic development but also political structural reform and improvement in democracy and the rule of law." In a possible sign of irritation at being asked questions about human rights by British reporters, Mr Wen said China believed states should not address one another "in a lecturing way" on the issue. "I am confident that tomorrow's China will enjoy not only economic prosperity but improved democracy and legal systems. It will be a country based on the rule of law," he added. Mr Cameron said trade with China represented a "huge opportunity" for the UK, and the countries were "on target" to meet their aim of expanding bilateral trade to 100 billion US dollars (£62.7 billion) by 2015, he said. And he said that, as an open economy, Britain was "the natural home for Chinese investment into Europe, making clear this could include major national infrastructure projects such as the planned high-speed rail link between London and the North. Mr Cameron said he would oppose moves in Europe to protect local markets against Chinese competition, which he described as "the wrong approach". Britain and China had agreed new arrangements to encourage "people-to-people" contacts, as well as a symposium to look at the issue of intellectual property, after bitter complaints from the UK's creative industries about the scale of pirating of music, film and patents in China. Mr Cameron welcomed Premier Wen's comments about the need for China to rebalance its own economy. But he was challenged by a Chinese reporter who said the UK had fallen to third place in Europe in terms of trade with the Far Eastern giant and to fifth in terms of trade in technology. The UK was overtaken by Germany last year in its investment in China, he said. The PM responded: "If you look at the figures, British exports to China grew by 40% last year and since November, when I visited Beijing, have gone up by 20%, so I don't accept that Britain isn't exporting more to China and isn't on target to meet the very challenging target of 100 billion dollars in bilateral trade by 2015. "I think the performance is good, but I want it to be better." The economies of the UK and China were "increasingly complementary", with Britain able to provide the expertise in areas like pharmaceuticals, education, green technology, oil and gas exploitation that are in greater demand as China's domestic markets grow, said Mr Cameron. 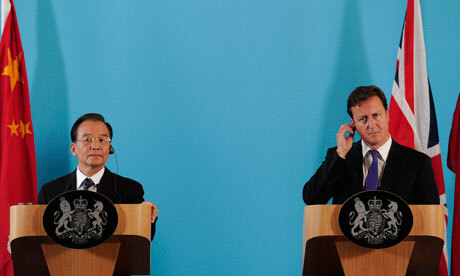 "Trade with China is a huge opportunity for the UK and we have a lot to offer China too," said Mr Cameron. "As our economies become increasingly complementary, the UK has the goods and services, the experiences and the skills to match China's ambition to move up the value chain." Increased trade in both directions will mean "jobs, growth and prosperity for all of us", he said. He cited a memorandum of understanding signed between British Gas and the Bank of China to provide a credit facility worth up to £1.5 billion (£940 million) to expand their operations in China. And he said drinks giant Diageo's growth in China was "an example of business success that we want to see more of in future". Mr Wen said he and Mr Cameron had witnessed the signing of trade and cooperation agreements worth a total of 4.3 billion US dollars (£2.7 billion). He said there was "no strategic conflict" between the UK and China and that "our common interests outweigh our differences". "A sound China/UK relationship will not only serve our respective development but promote positive evolution of the international landscape," he said. He said it was a mark of this relationship that China will be sending two giant pandas - Tian Tian and Yangguang - to Edinburgh Zoo by the end of this year, as announced by Vice Premier Li Keqiang in January. Premier Wen later visited the Royal Society in London, where he was presented with the Society's King Charles II medal, awarded to heads of state and government who display a commitment to science. His arrival at the Society's headquarters was met by a noisy demonstration by a few dozen supporters of Tibetan independence, and a counter-demonstration by supporters of the Beijing regime. But the protests did not disturb the presentation ceremony or Mr Wen's speech. Royal Society president Sir Paul Nurse said the medal was being bestowed on Mr Wen for overseeing "one of the most ambitious national research investment programmes the world has ever seen". Mr Wen said China's leadership recognised the need for "the spirit of independence of thought" within the scientific community and wanted to create "a better political environment and a freer academic atmosphere. He said he wanted to foster "an environment which encourages innovation, criticism and risk-taking" among Chinese scientists. Mr Wen added: "Tomorrow's China will be a country that fully achieves democracy, the rule of law, fairness and justice." He accepted that "corruption, unfair income distribution and other ills that harm the people's rights and interests still exist in China". "We need to create conditions for people to oversee and criticise the government and make government live up to its responsibilities and prevent corruption." Mr Wen said he could see that Britain had "regained confidence" since his last visit in 2009, when he sensed "anxiety and uneasiness in the air" in the wake of the financial crisis. He said Beijing's efforts to expand domestic demand and "fully tap into the potential for consumption" by its 1.3 billion people would help address trade imbalances and provide trade opportunities for British exporters. China was pursuing "peaceful development which is an opportunity rather than a threat to the rest of the world", he said.